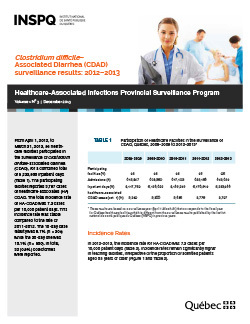 From April 1, 2012, to March 31, 2013, 95 healthcare facilities participated in the surveillance of Clostridium difficile–associated diarrhea (CDAD), for a combined total of 5,233,966 inpatient days. The participating facilities reported 3,797 cases of healthcare-associated (HA) CDAD. The total incidence rate of HA-CDAD was 7.3 cases per 10,000 patient days. This incidence rate was stable compared to the rate of 2011–2012. The 10-day case fatality was 8.7% (n=304) while the 30-day one was 16.1% (n=560). In total, 32 (0.9%) colectomies were reported.